Our staff scientist, Dr. Masashi Yoshimura, writes a monthly column for Ryukyu Shinpo on the topics of ants and the OKEON project. In the first column, Yoshi introduced the subjects of ants on Okinawa as well as the OKEON project. He also gave a brief history of how he first came about studying ants. Below is the content of the second column translated from Japanese, and the original articles can be found here (column 1, column 2). Now is the best season for late night shopping. You can see numerous bugs and insects attracted to the light coming through the windows of supermarkets and convenience stores. Squinting at the mass, I can identify the ones I’ve been looking for; male ants. Among other insects, male ants are best-known for growing wings only at the time of emigrating from one nest site to another to disperse their offspring as far as they can. Compared to female ants, the appearance of male ants looks much more similar to that of a bee than an ant. 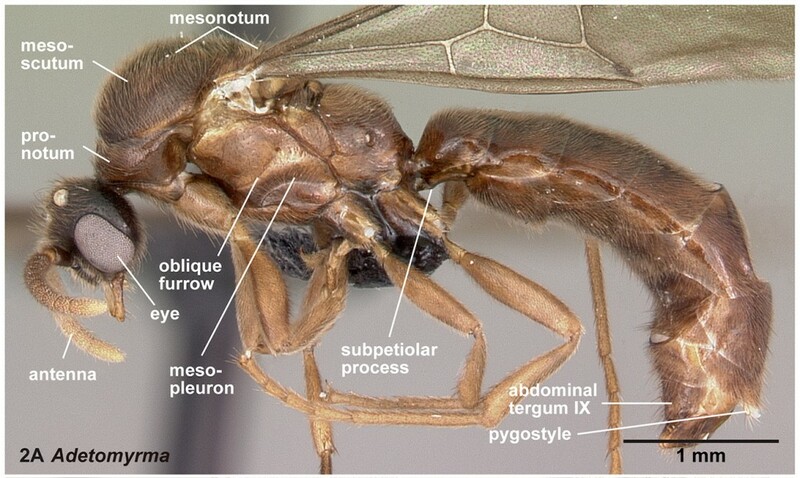 This is the area of my expertise: bee-looking male ants. Because of their distinguishingly “out-of-stereotype” appearances, much of their world still remain elusive as it is hard even to identify their types. It is one of the area overlooked for many years in ant studies. After the launch of my project, I have encountered a host of unresolved issues, as expected. The first ten years of the project were marked by much of the fumbling in the dark, struggling to find some guidance. Despite the difficulties, I could still take this audacious step no one had ever taken before. Indeed, it helped me enter into the world of scientific research (I was teaching at middle school at the time). Despite I spoke little English then, I landed a job in the US. Instead of being a “jack of all trades”, it was more important to be “one and only.” Since I was allergic to English when I was a student, conducting research in another language presented many challenges to me. Steeped in research, however, it was a bit surprising that I never felt daunted by these challenges. When I was in the US, through a word of mouth, I learned about OIST as an international research institution in Okinawa. I made up my mind to move back to Japan with the hope to be of some use. Instead, I’ve been given a lot of help from people in Okinawa, which underpins my daily research activities. Through the “OKEON Project,” we work to identify and understand change in the nature, so that the future will be more sustainable. Realizing the extent of the project, it requires all of our experiences mobilized in an effort to persistently pursue our goal. A new paper published by Cong Liu et al. in Ecological Monographs reports on how agricultural activity and the associated habitat conversion affects organisms by using ants as a surrogate for all invertebrates. 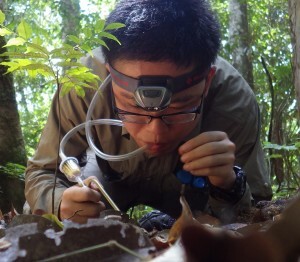 Specifically, the authors investigated the effects of conversion to rubber plantation on leaf-litter ant taxonomic, functional, and phylogenetic diversities in Xishuangbanna in southeast China. They found a sharp decline in species richness and low beta diversity after the habitat conversion.